The field of forest genetics may be abstract and sometimes difficult to understand, but it’s becoming more important for foresters every day. Even though we cannot see them with our naked eyes, the DNA of forest trees will play a major part in how European forests will look in a 100 years, due to threats to forests from the addresses of climate change (increased occurrence of catastrophic weather events) and global trade (invasive alien species in forests). If we are to have healthy and productive forests, we are going to need a lot of knowledge and wisdom – and also a bit of luck – when conserving and managing forest genetic resources. With the aim of learning from forest genetic scientists, but also communicating with them about the needs of forestry practice, a team of foresters from the Slovenia Forest Service set off to Thessaloniki, Greece, to take part in the LIFEGENMON and GENTREE joint stakeholders event on forest genetic monitoring, which took place from 23 rd to 25th of October 2017. The road took us from Ljubljana, Slovenia through Croatia, Serbia, Bulgaria to Thessaloniki, Greece, where the workshop took place. Our Greek hosts, the foresters from the Decentralized Administration of Macedonia and Thrace, warmly received us in the Porto Palace hotel in Thessaloniki. On Monday morning, an introductory meeting of both forest services took place. In the meeting, the foresters from both countries introduced themselves and got to know each other. In a relaxed atmosphere, the words started flowing and already in the beginning, a lively discussion took place. After the meeting, we drove to the LIFEGENMON forest genetic monitoring plot under Mt Olympus. The Greek foresters presented the Greek Bulgarian fir (Abies borisii-regis) forest genetic monitoring plot and the work that is currently being conducted there. Along with the firs, plenty of chestnut (Castanea sativa) trees populate the plot. After the presentation, there was a discussion about the practical forest genetic monitoring measures, especially the protocols for phenological measurements. In the light of current problems with game browsing in Slovenia, there was also discussion about regeneration and game management in that area – we found that there are significant differences between game management in Slovenia and Greece, and that the situation in Greece is not as problematic form the viewpoint of forest regeneration. After visit to the plot, we visited a small village under Mt Olympus and attended a working lunch. 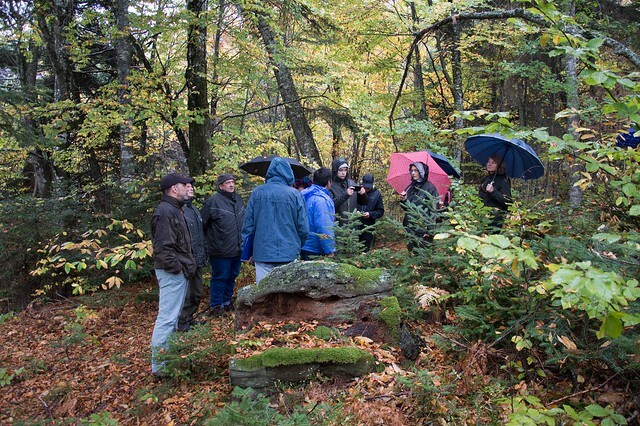 There, we discussed about what we saw and learned at the plot and compared Greek and Slovenian forest management, especially the aspects of forest genetic resource management and conservation. The day was concluded by a trip back to Thessaloniki and evening preparations for Tuesday’s workshop. This blog post is a part of a series of blogs on the participation of foresters from the Slovenia Forest Service in the LIFEGENMON and GENTREE project joint stakeholders event on forest genetic monitoring, which took place from 23 rd to 25th of October 2017 in Thessaloniki, Greece. Read next: Part two: What does forestry practice need from forest genetic researchers?